Dress up a plain Jane seared chicken breast with the belle of the ball side dish of Sauteed Winter Slaw with Maple Vinaigrette. The vibrant hues of orange carrots, yellow butternut squash, green scallions and white turnips and parsnips jump out of the bowl to brighten any dinner plate. The zip of apple cider vinegar and sweetness of maple syrup highlight the light vinaigrette which is dressing the tender crisp sauteed vegetables and fruit. A unique side dish can make the most ho hum entree seem.....well....not so ho hum. In a large bowl, whisk 2 tablespoons of the olive oil, maple syrup, apple cider, salt, pepper and scallions. Set aside. 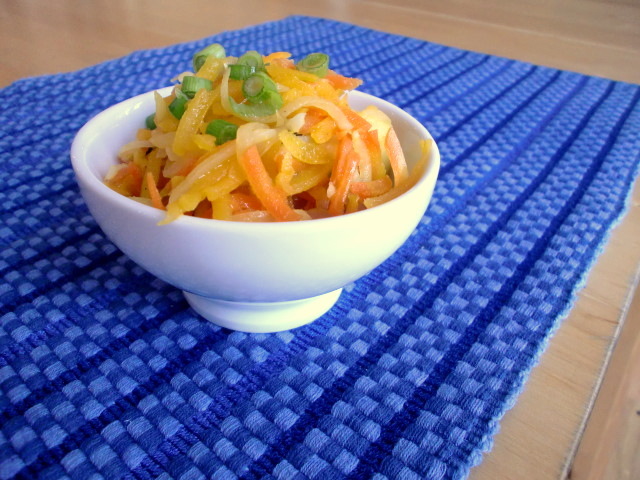 Shred butternut squash, carrots, turnips, parsnips, and apples in a food processor using the medium shredding blade. Heat a large saute pan over medium high heat and add 2 tablespoons of the olive oil. Add the vegetables and fruit and saute, stirring occasionally for 6 - 10 minutes, or until they are tender crisp. Place in bowl with the vinaigrette and toss to coat evenly. Note - the inspiration for the recipe came from a personal chef friend of mine. If you are in southern New Hampshire and looking for a personal chef, look up Patti Anastasia of Anastasia'sTable. There are not very many recipes these days that really spark my interest but this is one of them! !